Gorgeous cards! Love this kit! Love the gold and black combo. So gorgeous! Awesome cards, Yana! Love all the gold & the car is fabulous! Wonderful card designs! Lots of beautiful gold! Especially love the gold on black. Lovely cards and great HA kit! TFS! The gold fits perfectly for the Art Deco!!! My favourite is your gold and black card!!! But all fabulous!!! The gold fits perfectly for the Art Deco!!! My favourite is your black and gold card but all fabulous!!! 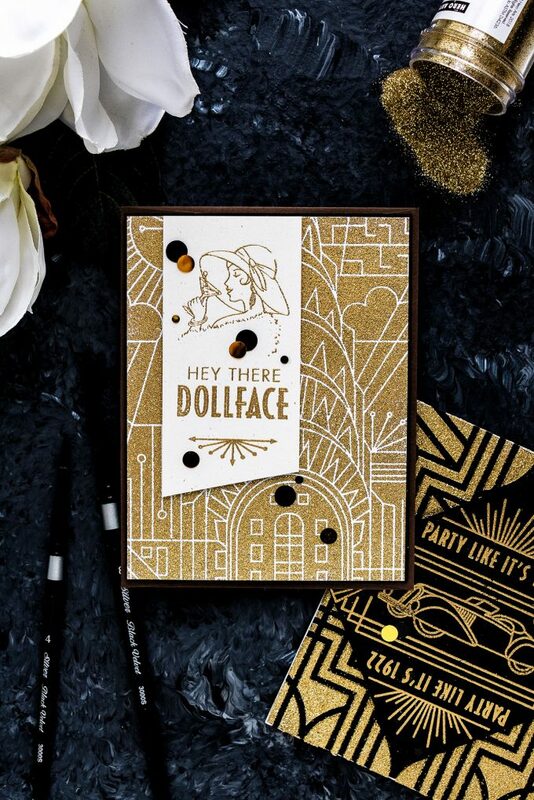 I love the gold theme of your cards, make them look very classy. Yana, your cards are so elegant! I just love all three of them! Your designs and color choices are wonderful! Beautiful creations ! The car is awesome! Stunning ! 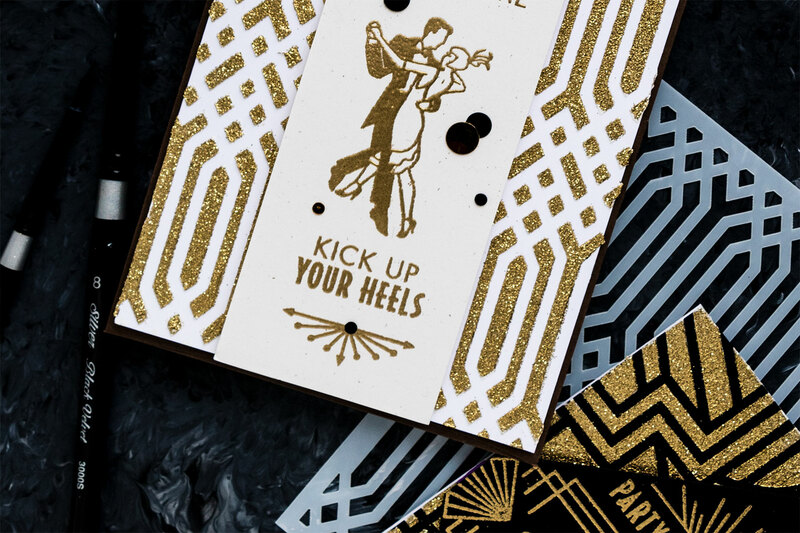 All your cards are so glitzy & beautiful, such a fabulous idea with the texture gold background in the first example. Well worth a gold glittery cat . I do understand why you love this era so muchmuch. Thank you for all your inspiration. Hello and thank you for the wonderful inspiration Yana. This is a fantastic release. Exactly what I was hoping for, totally different and a great surprise. Your cards are always elegant and beautiful. Makes my day to hop around to all the blogs and see what everyone has created. Wishing you a lovely day. I love all your creations using this kit – thanks for inspiration! Really liked your cards. 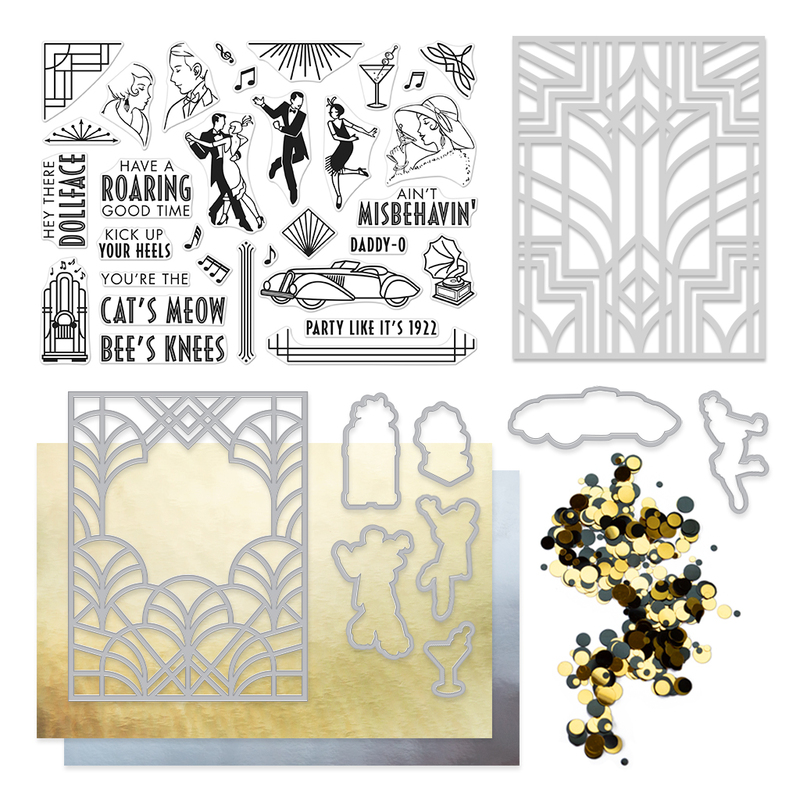 I want to do some of the backgrounds you did with the paste and glitter embossing powder! 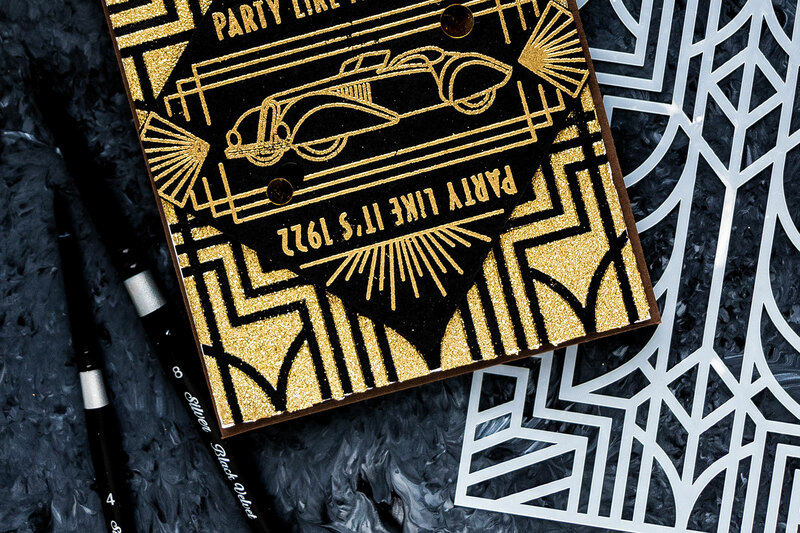 These art deco cards are amazing… love your use of the glitter embossing powder — just beautiful. Love the black and gold! Beautiful cards! Hero Arts you’ve done it to me again, ordered!! You made some beautiful cards! 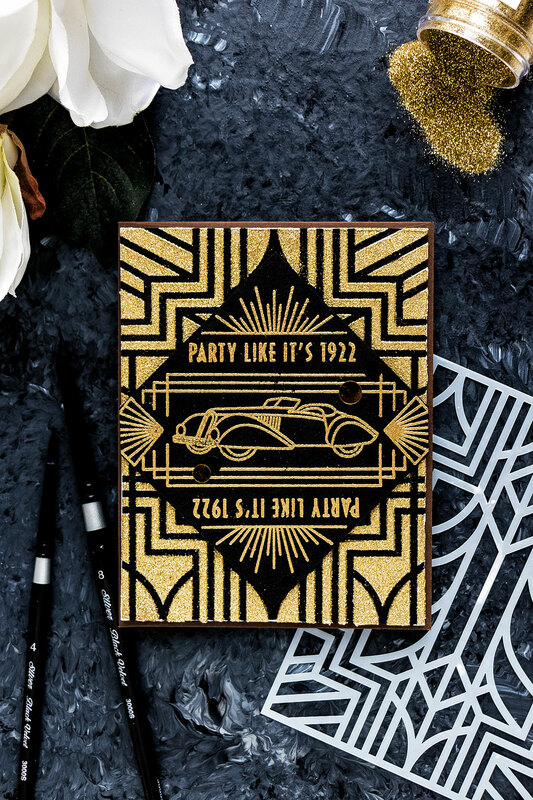 I love all of the glitz with this Art Deco theme. Oh Yana, These cards are fabulous. I especially love the backgrounds of each of your cards. One of my favorite Art Deco buildings is the Guardian Building in Detroit, Michigan, US. Check it out on the web, I think you will like it! As always thanks for the inspiration. This Hero Arts kit is amazing. 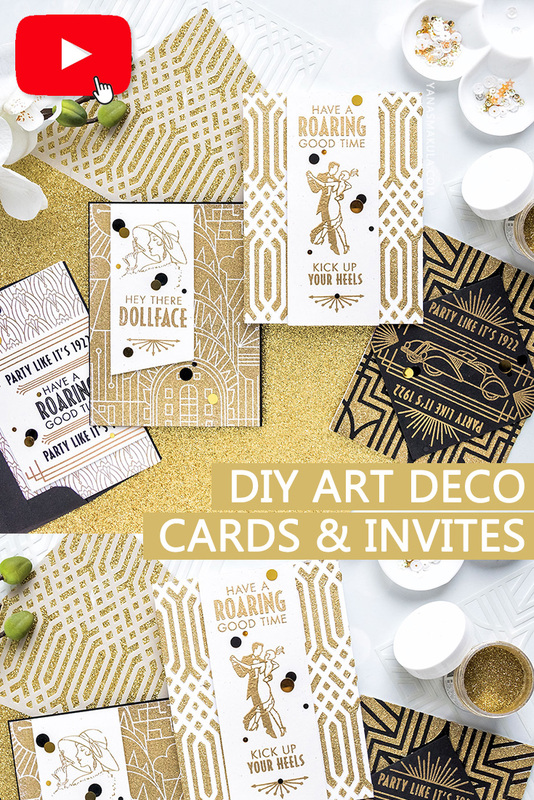 such fun and classy cards you’ve created with this wonderful kit! Nicely done cards! You went ALL out! What fun! I love your use of black and gold, it is so striking! Wonderful ideas! 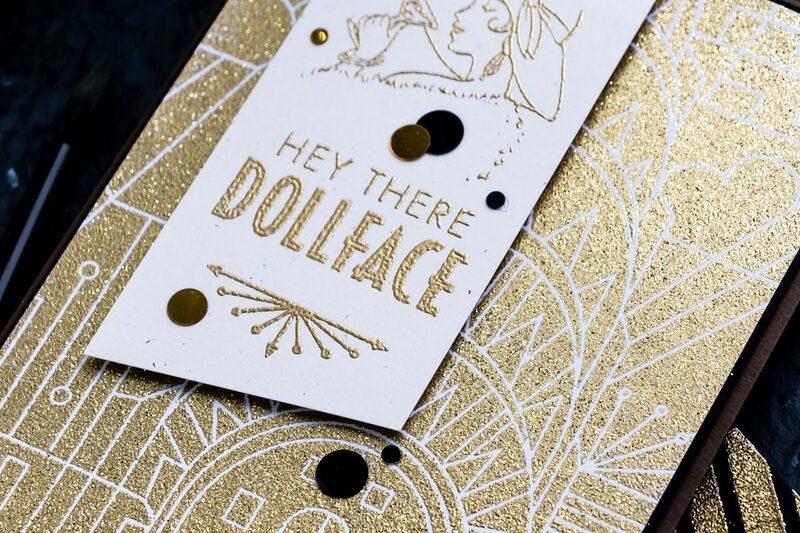 Beautiful use of gold embossing powder. 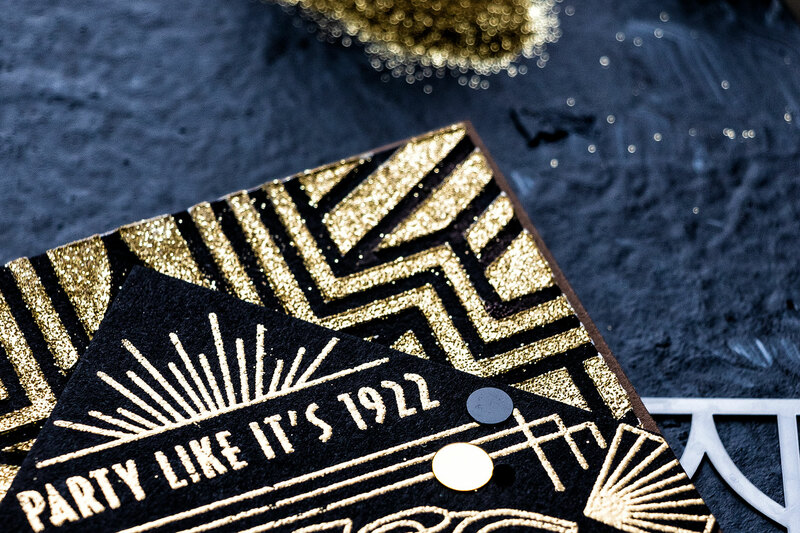 Gorgeous glittery cards. 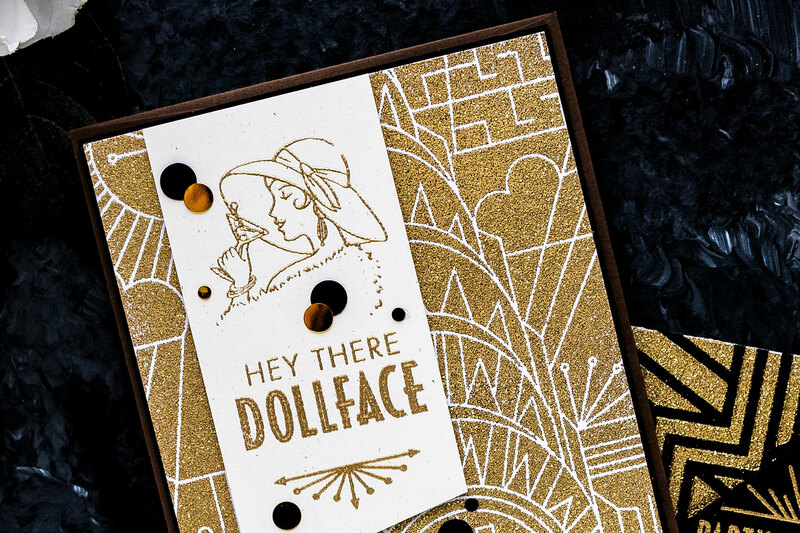 The gold glitter is wonderful and I especially love how it looks with the fine detail lines on the Dollface card. You are the Glitter Queen! These are just gorgeous! Such gorgeous cards. 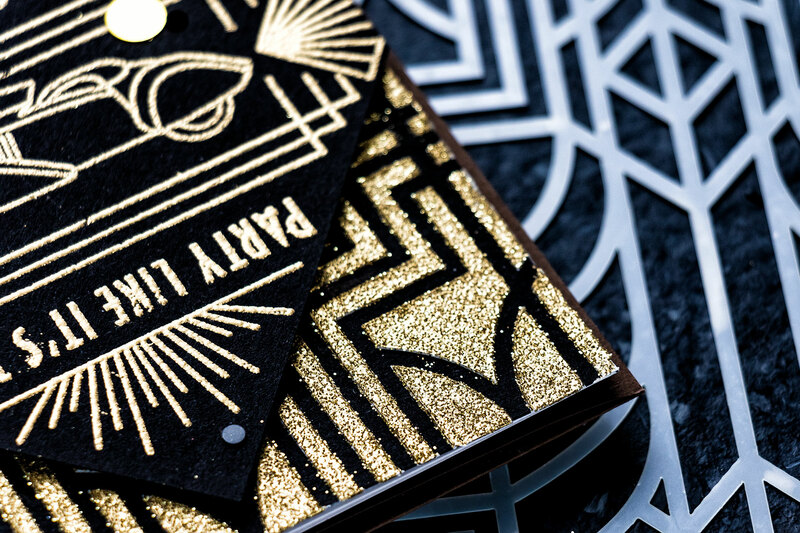 Love the gold on the black card. Such wonderful and striking cards! gorgeous cards! so elegant and retro ♥ loving the look of this kit! I too love Art Deco. Your cards are beautiful. 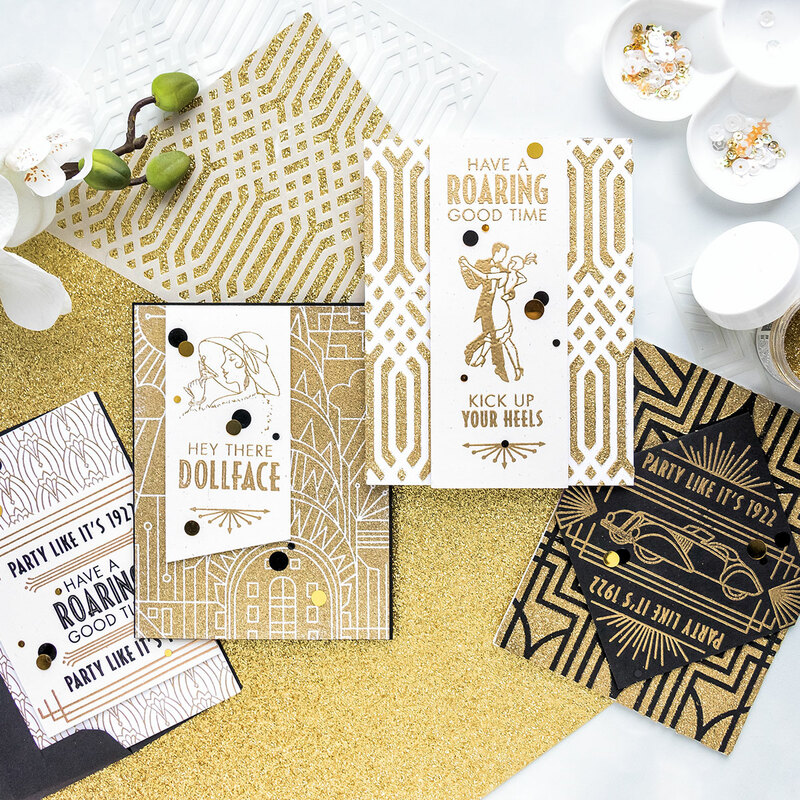 Fabulous set of cards–love all the sparkly gold. Awesome new Kit, I love the Art Deco style! Gorgeous creations! 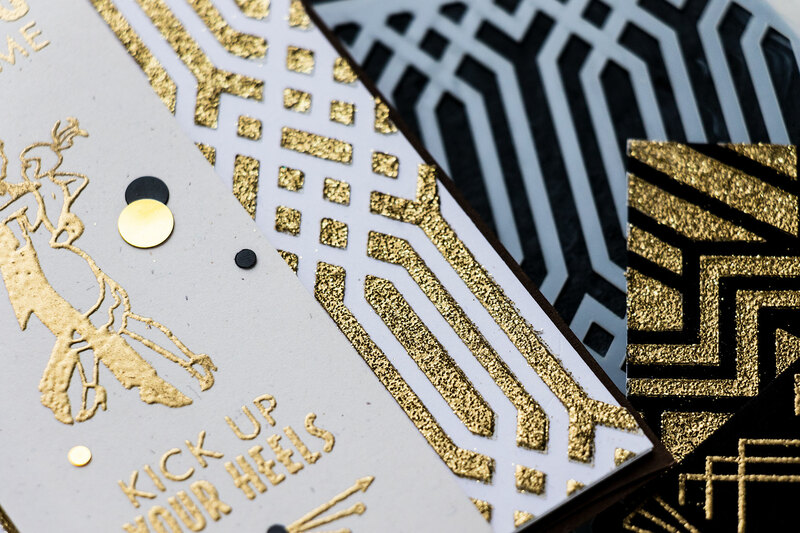 I especially love the gold on black card! Thanks for the video! gold really fits in with the theme. I love glitter and bling! Your cards are gorgeous. The more I see, the more I want this set. All of you have done a fabulous job! Absolutely gorgeous cards Yana! I love all the glitter – it seems that time period just calls for it! Thanks for the great inspirations! I really like the mirrored sentiment! 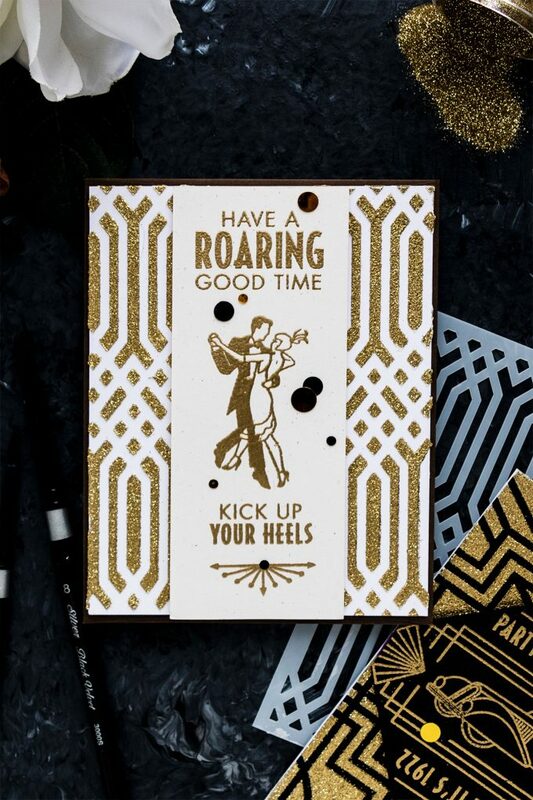 These cards are so glitzy and glam! I am excited about the potential this kit offers to make cards for so many occasions. Inspiring! I love the elegant car card–simply amazing!